When we soaked the dried figs in hot water with star anise, cinnamon sticks and an aniseed and fennel seed herbal tea overnight, we were intending to make a North African style fluffy chicken (rabbit) dish with cinnamon, figs and prunes. However, on arriving at the supermarket, filet mignon of pork was on special offer, so things moved on. This recipe is this evening’s invention from James. Ginger, garlic, coriander seeds and ground cloves were whizzed up in the blender and fried in olive oil. Then he added the onions and softened them, and browned the pork. 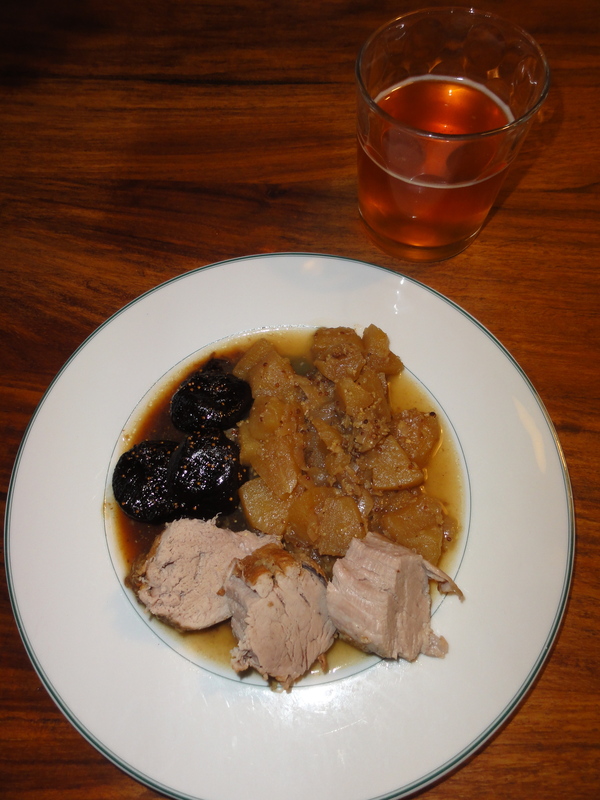 Then he added the cider along with the chopped apples and a heaped dessertspoon of wholegrain mustard, and the dish was put in the oven. For the sauce, he boiled up the figs with the brown sugar in some of the soaking liquid, reducing down the mixture and adding more of the liquid as necessary.